Home / Dog / Dry Food / Go! All of our GO! DAILY DEFENCE™ dog recipes are nutrient-packed and nutritionist recommended to give dogs the preventative care they need to stay strong and healthy for life. Our GO! 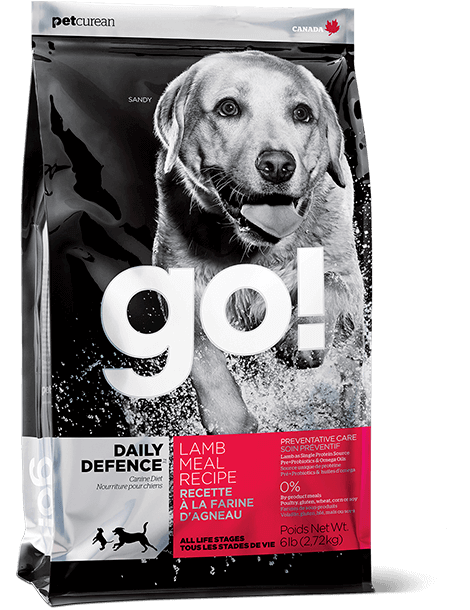 DAILY DEFENCE™ Lamb Meal Recipe is the only DAILY DEFENCE™ recipe to feature a single meat protein source (lamb meal and deboned lamb). Lamb meal, oatmeal, whole brown rice, de-boned lamb, canola oil (preserved with mixed tocopherols), coconut oil (preserved with mixed tocopherols), natural lamb flavour, flaxseed, salmon oil, alfalfa, potassium chloride, sodium chloride, apples, carrots, cranberries, dried chicory root, dried Lactobacillus acidophilus fermentation product, dried Enterococcus faecium fermentation product, vitamins (vitamin A supplement, vitamin D3 supplement, vitamin E supplement, inositol, niacin, L-ascorbyl-2-polyphosphate (a source of vitamin C), d-calcium pantothenate, thiamine mononitrate, beta-carotene, riboflavin, pyridoxine hydrochloride, folic acid, biotin, vitamin B12 supplement), minerals (zinc proteinate, iron proteinate, copper proteinate, zinc oxide, manganese proteinate, copper sulphate, ferrous sulphate, calcium iodate, manganous oxide, selenium yeast), choline chloride, taurine, L-lysine, DL-methionine, yucca schidigera extract, dried rosemary.